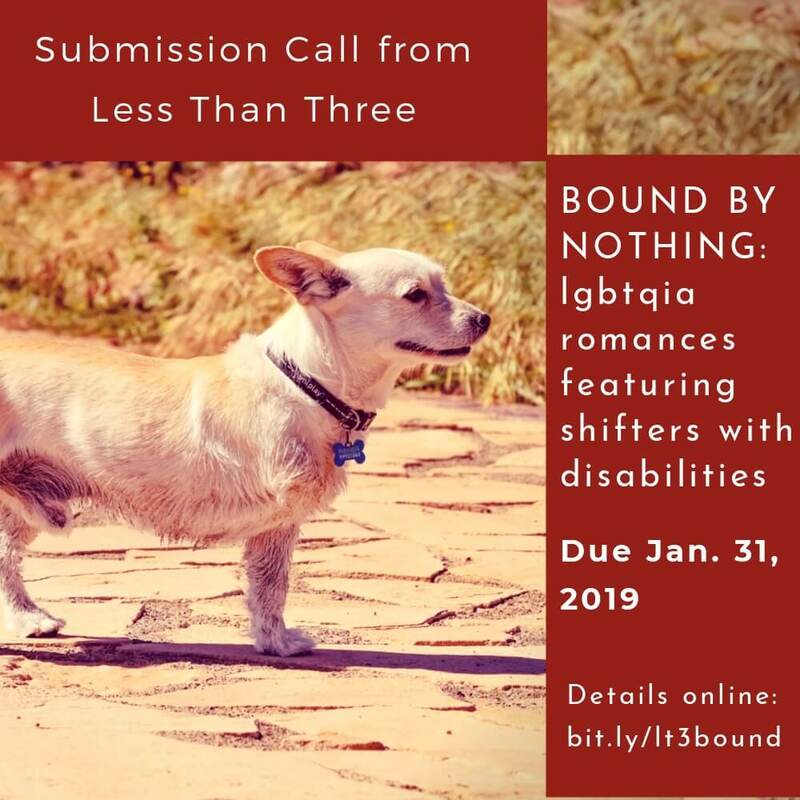 Bound by Nothing — LGBTQIA Collection Call — Shifters are a league above humans: stronger, faster, more powerful, better senses; sometimes they’re longer lived and have special abilities—even magic. The one thing seldom seen in shifter stories are disabilities. Werewolves who can’t hear, werefalcons who can’t see, shifters with chronic pain or severe depression—where are their stories? Less Than Three Press invites you to submit stories of shifters with disabilities, from the physical to mental, visible to invisible. Payment: 45% of cover price for all ebook sales through Less Than Three’s website; 40% of gross earnings for sales through 3rd party distributors; 20% of cover price for all sales of print books. Authors of works of at least 40,000 words receive 4 copies of the print book. Rights the publisher asks for: Exclusive rights for a period specified in the contract, generally a minimum of 2-3 years. Author retains copyright. Response time: You should receive a confirmation email within an hour of submitting. You should receive a decision in 6–8 weeks. Format: Format your manuscript in Calibri 12 pt font with 1.15 line spacing and one space (hard return) between paragraphs. Do not add space before or after your paragraphs and do not indent your paragraphs. Use half-inch margins on all sides. Do not add headers or footers. Find all details at www.lessthanthreepress.com/submissions. Will they take reprints? Yes. Find more details at Collection Calls | Less Than Three Press, and don’t forget to tell them you found their submission call here!